I will be interesting in hearing about the discussion of The Scarlet Letter. I haven’t read it since high school, and I didn’t like it very much then. Liz, if you have time, maybe you should give The Scarlet Letter another read. It’s short—only about 150 pages. Hester Prynne, the protagonist, is, IMHO, among the strongest characters in American literature. The men in the book don’t fare so well, and Hawthorne uses great irony to skewer the hypocritical Puritans. Being a guy who never quits on a book, I feel your pain. You gotta read more than a few stinkers to get to the good stuff. I had a similar reaction to The Book Thief. It was one of those books I was told I would love, and while I certainly liked parts of it, I didn’t love it. It never really resonated with me emotionally, and like you, I found it gimmicky. So you’re not alone, Marianne–and I’m glad you weren’t alone in your group, either! I don’t remember reading the book, and so I shall. I was able to download The Scarlet letter to my kindle app for free today. Reading will commence latter, have a few notes to write and some quilt blocks to stitch. 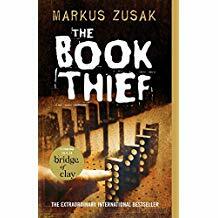 Book Thief: Loved the book and the movie! Haven’t read The Scarlet Letter in a very long time. Might have to try that again. Read the book a few years ago. As someone who has lived in a Jewish community and had a landlord who had been in Auschwitz I think any story of this nature should be shared and that comments about the style or fonts or whatever are far far from secondary.